In a matchup of the preseason favorite and the upstart, EMU came out on top. 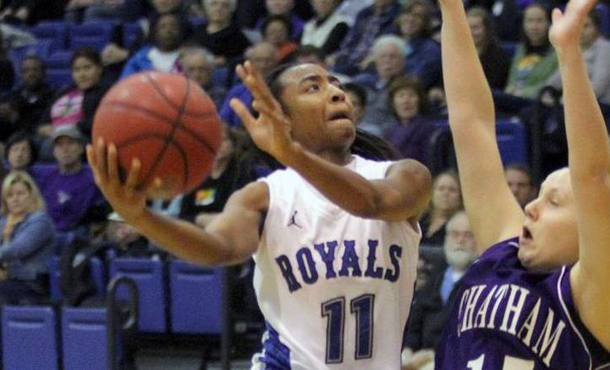 The Royals, picked first in the ODAC’s preseason poll, grabbed an early lead and never let it go in an 87-64 win over upstart Randolph College in Yoder Arena. Both teams entered the game at 5-1 overall and 2-0 in the Old Dominion Athletic Conference, but Eastern Mennonite took over sole possession of first place in the league with the win. EMU’s women opened the game with a three pointer from Jess Rheinheimer (Manheim, Pa./Lancaster Mennonite), but the WildCats scored back-to-back buckets for a 4-3 lead. The Royals responded with a 14-4 run over the next three minutes, zipping ahead 17-8. Randolph got back within five points before the women put on the defensive clamps. EMU held their visitors scoreless for a span of 4:33, tallying 14 unanswered points to blow open a 37-17 cushion with 7:29 left in the period. By halftime, the Royals led 49-31. The WildCats got within 15 two times midway through the second half, but the home team pushed back out to their biggest lead at 81-54 with 4:47 left to play. The teams emptied their benches from there, as EMU cruised to the 23-point win. Although the overall shooting percentages were close, the Royals did a ton of damage by going 7-for-17 from three point range. Randolph was just 3-15. EMU also dominated at the free throw line, going 22-29 compared to the WildCats’ 9-16. The women also had a 49-40 edge in rebounding, including 18 offensive boards. After scoring the game’s first points, Rheinheimer led all players with 17 and added six rebounds. Bianca Ygarza (Conestoga, Pa./Penn Manor) had 15 points, six assists and six rebounds. It was the forward’s second straight game tying her career high with six handouts. Alisa Brown (Dumfries, Va./Forest Park) hit three triples and added 15 points and three steals. Shakeerah Sykes (Dumfries, Va./Forest Park) had 11 points. Keyla Baltimore (Bristow, Va./Brentsville District) did a bit of everything with eight points, six rebounds, four assists and three steals. Becky Barrett (Damascus, Md./Damascus) was good for nine points and a game high eight rebounds. Brie Holden led Randolph off the bench with 11 points. Abigail Bullins had nine points and five assists. The Royals hit the road to wrap up their first-half schedule with three games. That stretch opens with a tough contest at Ferrum this Saturday at 2:00pm.